It's universal. It works on 24 million vehicles on the road today, spanning 31 car brands, built from 1989-2002. Easy setup. Just like a universal TV remote, setup is simple, requiring no tools. “Dealer-beater” price. At the suggested retail price of $24.95, it costs consumers about half what they’d pay at a dealership for a traditional replacement. Do-it-yourself setup You’ll follow some very clearly written instructions so the remote and vehicle will work together. Setup is simple, fast, and uses no tools. This tough, water-resistant remote provides inexpensive, reliable, and easy-to-use access to your car's remote entry system. This handy remote works on over a thousand different car models, and is backed by a 6 month warranty. A retailer’s dream come true; a single-device solution So, for the first time ever, retailers can satisfy those customers’ needs with a single device. It works like its popular cousin—the universal TV remote. 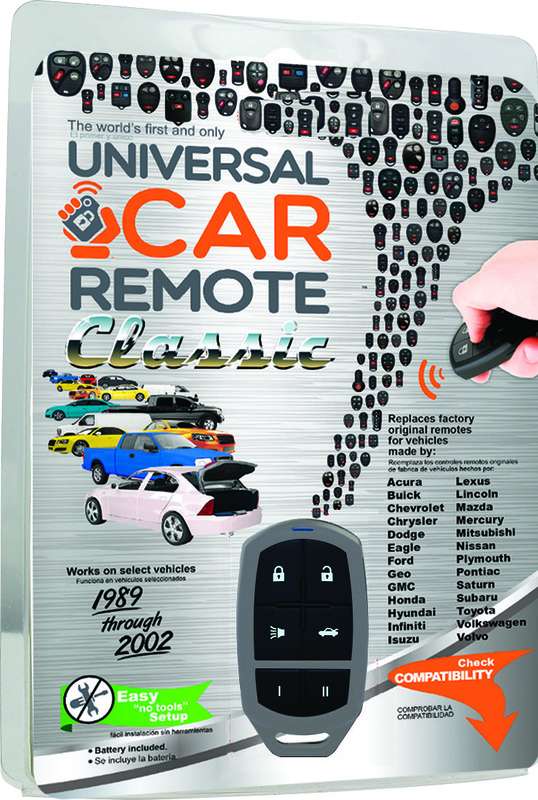 The Universal Car Remote Classic has the capabilities of 106 remotes packed into a single device, so it replaces factory original remotes for vehicles made by 31 car manufacturers -- from Acura to Volvo. The bottom line for consumers Before the Universal Car Remote, dealerships had a genuine monopoly on replacing remotes. The Universal Car Remote changes all that, allowing consumers the opportunity to pick up a replacement at a local store--avoiding the time, expense, and hassle of a dealership appointment. The bottom line for retailers The product’s universal capabilities, simple setup, and low price make it ideal for retailers. It’s perfect for big-box stores, auto parts stores, hardware stores, home improvement stores, locksmiths, car dealers, fast oil change shops, independent garages—any business that services vehicles or has customers that drive cars. Before the Universal Car Remote Classic, it was impractical for retailers to sell replacement remotes due to their high cost and wide variety. Now, major retailers and small shops alike can easily enter into the profitable automotive remote replacement industry by selling a single, easy to use, low-cost device. About Solid Keys USA: a division of iKeyless LLC. Established in 2002, iKeyless, LLC is a privately-held technology company headquartered in Louisville, KY USA. iKeyless leads its industry, specializing in the design, manufacture, retail and wholesale distribution of automotive keyless entry remotes and transponder keys. iKeyless began as the Internet’s first retailer offering consumers replacement automotive keys and keyless entry remotes. In 2008, iKeyless purchased a second-hand van and experimented with servicing business fleets and car dealerships. The division, now known as Car Keys Express, operates nationwide with employees in 42 states.